It’s often been said that it’s best to allow every man a peaceful death…regardless of what his life was like. No matter what the tally for both good and bad deeds were on his life’s ledger. However, as the mainstream media puts out effusive accolade after accolade “in loving memory” of Senator John McCain, it’s impossible to stand by and listen to so much obvious falsehood and absurd fiction. 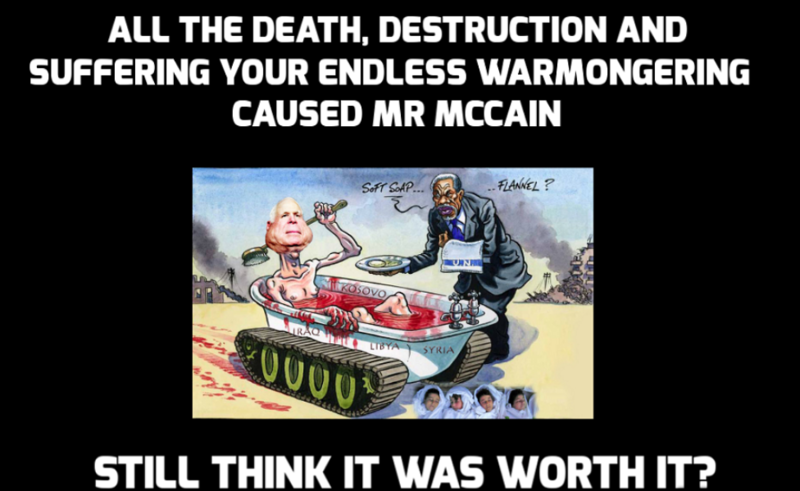 John McCain — May God rest his soul in peace — was at heart an inveterate warmonger and war criminal. McCain never saw a war he didn’t like and aggressively promote. For some strange reason McCain really liked war. He made starting wars and continuing wars his life’s work. The following video demonstrates just how easily warmongering came to McCain. 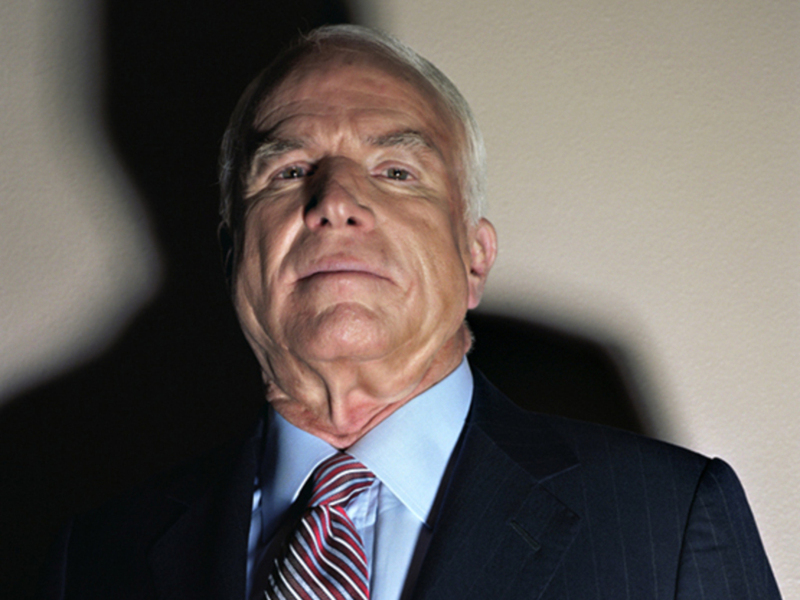 The true story of John McCain is anything but one about a war hero. In deference to his family we dare not write the true story as many firsthand witnesses have recounted it from different perspectives. The back story of his war hero status is full of so much perfidy and fraud that it’s best not retold on the day after his passing. Nevertheless, for those who seek the truth about this extremely flawed individual, the following exposé provides some excellent insights and conveniently hidden history. However, the MSM will not be restrained in their hero worship of a man who was in fact quite the opposite. The tragedy is that he is being held up high as an example by the establishment of a patriot? John McCain was no patriot! In fact, he was a traitor to his country by the very fact that he committed treason against the POTUS and the American Republic…until his dying day. During his last days, there were clear omens that presaged his coming death. For example: Eclipse OMEN for John McCain. Given the extremely inconvenient truth about McCain’s military record, it’s no surprise that it was a highly suspicious naval accident that was used to send a message worldwide about the abrupt end of his political career and military exploits. See: NAVY RELEASES McCAIN’s RECORDS – McCain was personally responsible for the deadliest fire in the history of the US Navy. There’s no question that John McCain was Deep State’s shadow Secretary of State. Many of his travels concerned stirring up war in countries around the world. He was quite the troublemaker where it concerned advocating war and conflict on behalf of his revered Military-Industrial Complex (MIC). If ever the MIC has a full-time ambassador, it was Senator John McCain. Were one to trace his itinerary to the world’s foreign capitals, it becomes quite clear that a path of death and destruction always followed in his wake. This is simply what McCain was paid to do by his true masters in the World Shadow Government. He never worked for the American people; rather, he answered directly to a clandestine international crime syndicate that profits considerably from illegal arms trafficking and other criminal enterprises. Let’s be clear, John McCain is not a war hero. For those who do not believe this self-evident fact of history, the following article lays bare the truth. Remember when Cain killed Abel over practically nothing. The $64,000 question is: Why did John McCain sanction so much killing in his lifetime? Was he born with his murderous pschopathy? Or was he painstakingly trained to become a warmonger? Or were both of these personal dynamics at work over the course of his highly consequential and catastrophic lifetime? SOTN had planned on staying perfectly silent as we always do when a notorious evildoer passes from the Earth realm. However, the CIA’s Mockingbird Media’s completely incongruent and wholly misrepresentative reaction to John McCain’s passing demanded a response. If for no other reason, the many souls whose lives were taken prematurely by his incessant warmongering warranted justice. The many innocents in Syria alone, who have experienced so much pain and suffering, deserved the hard truth to be told about Senator McCain’s part in that engineered war.